You are going to Watch Naruto Shippuden Episode 380 English subbed online free episodes with HQ / high quality. 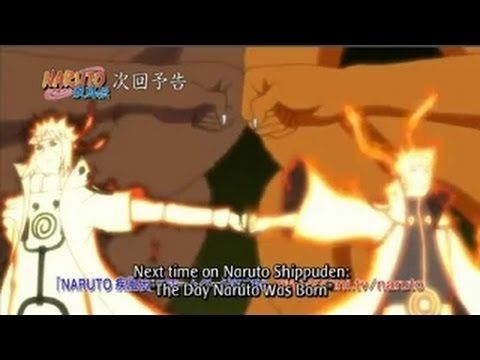 Stream Anime Naruto Shippuden Episode 380 Online English sub The Day Naruto Was Born. Yin-Kurama asks Minato whether he intended to let Naruto clean up after him, telling him to not to blame himself from his wife’s death and that making his son the jinchuriki of Kurama’s Yang half turned out good. Now seeing that he could not be careless now that Naruto found a means to injure him, Obito decides to casually begin Project Tsuki no Me by creating a giant flowering tree to wipe out the remaining Allied Shinobi with four Tailed Beast Balls. Furthermore, with Hashirama giving the Shinobi Alliance a plan through a wood clone as he cannot talk Madara into a momentary ceasefire to help them directly, everybody is fenced in by Obito’s barrier so that they would not escape. Luckily, on a gambit, Naruto comes up with his own plan and asks Minato to bump fists with him so their respective Kuramas can connect through them.